^ One side of the completed vehicle, depicting the 502 launch. ^ The other side of the finished bird. ^ Completed detail of the Vulcain engine and lower SRBs. Buffing Metalizer gives the parts a lifelike look. 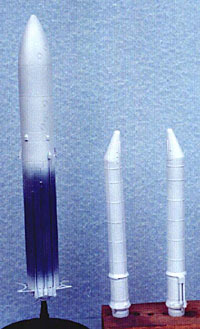 Overall Rating: 10 This is the best styrene rocket kit on the market. 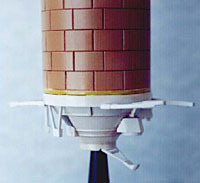 I have been building rockets for the last 10 years and this model is the best styrene rocket kit that I have come across. The attention to detail is excellent and has only been equaled by the few resin rocket kits on the market. I chose to model the Ariane 502 launch vehicle, this was the second test vehicle, but the first to be successfull since the 501 mission exploded due to faulty avionic software. The first step in construction was to gather my reference photos. I found a lot of very good pictures of the 501 and 502 vehicles at the ESA website, these were essential in the painting stage as the kit's painting instructions were very inaccurate. Something that I do with all of the models I build is to remove the alignment pins and sand the mating surfaces flat so there would not be any little gaps when assembled. This saves a great deal of time by not having to go back with putty and more sanding and filing. Next, I assembled all of the tubular sections, the SRB's, central stack and the nose fairing, first with thin CA on the inside, then going over the outside seam with Weld On #3 (my favorite). The halves fit together so perfectly that I almost cried. After the glue dried, light filing and sanding was all that was required to completely blend the halves. One thing that I noticed when putting these parts together was that the sprue connections and seams are all on parts of the model that are hidden or obscured from view, this means that I only had to make half of the seams perfect, and the other half I just ran over with a file to make them less obvious. The seam between the halves of the nose fairing are thoughtfully placed where the fairing separates to release the satelites, after minor cleanup, this seam line should be accented lightly with a pencil. 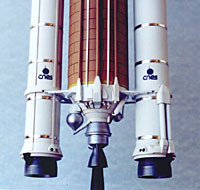 When the major assemblies were finished, the tank struts and other parts at the bottom of the central stack were put on, as well as the parts on each SRB. At this time, all of the parts except for the liquid fueled engine were washed and primed with grey paint. Next, the parts were painted gloss white, the insulation on the central stack was masked and painted varying shades of desert yellow, and individual bricks were masked and painted a darker shade. At this point, all of the painted parts were airbrushed with diluted gloss acrylic laquer. I used 3 parts laquer thinner to 1 part acrylic laquer and sprayed the whole model with an even coat. This makes a very hard, smooth glossy finish that will not be attacked by the oil wash applied over it. The wash is a thin mixture of 'burnt umber' oil paint thinned with airbrush thinner, this was then applied to all of the detailed recesses and panel lines and rubbed off. Finally, all of the metallic parts were masked and painted. This is the section of the instructions that should be used as kindling for your bbq. The three tanks at the bottom of the stack are chrome silver, the engine bell and SRB nozzles are 'exhaust' from the Testors buffing metallizer line, the pipes next to the liquid fuel engine bell are dark metallic silver, and the engine fairing is polished aluminum color. These are the best color matches that I found comparing to the photos I used for reference. I polished the engine bells with a rag wheel on my dremel to get a nice low gloss sheen. At the bottom of each SRB are four vent holes that are not molded in and should be drilled using a 1/8" bit. After all of the painting is done, the decals are applied, I was not very happy with the color alignment of the decals, this was the only part of the model I was dis-satisfied with. The decal film is extremely thin and completely disapeared onto the model when they were applied, this made me feel a little better about the colors being mis-aligned. When the decals dried, a final inspection was made and some paint was touched up. The entire model except for the metallic pieces were sprayed with Pactra clear flat. The last step is applying the chrome silver stripes around each of the solid rocket boosters, this was done with 1/16" wide strips of Bare Metal Foil. This is the first time I have used this product and I have to say that I really like it, it is very thin aluminum foil with a light adhesive on the back. The foil was buffed with a Q-Tip to make it conform to the raised detail it was applied over. In conclusion, I have to say that Heller has done quite a fine job creating this model, and I am really looking foreward to getting my hands on more of their kits. Heller is creating a line of space vehicles in 1/125th scale which so far only includes the Ariane 4 and 5, and coming this spring will be a 1/125 Mir space station. United in their determination to give Europe an autonomous access to space, the Ministers of ten European nations met in Brussels in July 1973 to create the European Space Agency. Their decisions paved the way for the next 25 years: a 'package deal' that, with the Spacelab contribution to the US Shuttle programme and the Marots/Marecs satellite project, gave birth to the European launcher. The first Ariane lifted-off out of Kourou on 24th December 1979. Test flights, promotional and then commercial missions followed over the years. The initial vehicle was improved, and the Ariane family of vehicles catered with increasing success to market needs. 12 and a half years elapsed between the maiden flight and the 50th mission; the next 50 were accomplished in only 5 and half years ! In less than 50 years, mankind's ascent into the sky has been phenomenal. " Up, up and away - and even further ! " There are few areas of technology where progress has been so fast. The first Sputnik was launched in October 1957. Few people heard its beep-beep. But today our planet is ringed by hundreds of satellites that communicate our smallest desires. Let just one break down, everyday lives seem to grind to a stop! Further away, space probes and telescopes reveal new worlds that light our desire to journey onwards ! Europe was certainly not first in the field of space but its nations have caught up with their mentors and in certain domains now surpass them. Thanks to a few visionaries, much rigor and perseverance, today 'Europe is in Space'. The most brilliant example comes under the name 'Ariane'. The maiden flight of an Ariane 4 took place in June 1988. 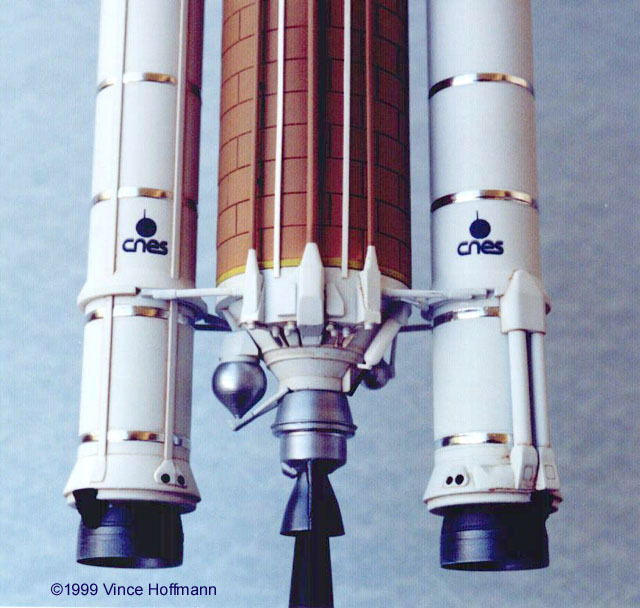 Anticipating the requirement to orbit increasingly large and heavy spacecraft, the need to ensure the future of the Ariane launcher system was realised very early. 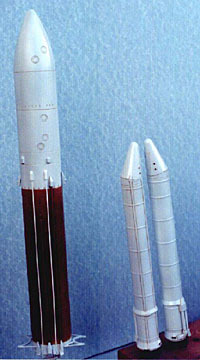 Gathered first in Rome in January 1985 to approve the principle and release initial funding, Ministers then met two years later in The Hague to authorise the development of the successor, the new Ariane 5 heavylift launcher. A decision that was taken even before the first flight of Ariane 4! The Ariane 5 development programme has been directed by the ESA, the European Space Agency. CNES, Centre National d'Etudes Spatiales - the French Space Agency - has had executive management responsibility. Since the Ariane V9 mission in 1984, ARIANESPACE has been responsible for industrial production and management of the Ariane launch vehicles, marketing and providing launch services and carrying out the actual launch operations in French Guiana. It has, in parallel with ESA and CNES, concentrated its efforts on building up the competitiveness of the new Ariane 5 system to meet the needs of an increasingly demanding market. Aerospatiale is the Industrial Architect for the programme. The principal prime contractors are : Aerospatiale for the cryogenic and solid booster stages, SEP - Division of Snecma has developed the Vulcain engine, Europropulsion, a joint subsidiary of SEP and FIAT AVIO, has developed the solid propellant motor of the solid boosters. Matra Marconi Space has worked on the vehicle equipment bay, DASA Deutsche Aerospace on the storable propellant stage, DASA Dornier on the Speltra dual payload structure, Oerlikon-Contraves on the fairing whilst CASA has developed the payload adapters. All these prime contractors have been backed by a large number of European subcontractors. ^ The initial paint pass. ^ The final paint coat and oil wash applied. ^ The base of the central stack, sans final detail parts.